Letter from Texas . . .
I’ve just returned to my lodging from the first two days of the Texas Librarians Association meeting in Dallas. Wow . . . My head is spinning from sensory overload. I’ve met so many cool people, some wonderful writers and many fantastic librarians. I’m sure many of them will use me for programs this next year. Though most of my time was spent signing books at the Pelican Booth, I did spend a great deal of time playing music for one of my sponsors, The World and I. I’ll talk more about Mr. Kim the publisher and this stimulating online program in future posts. Go to this site for a quick look at his wonderful product, an interactive and online encyclopedia (http://www.worldandischool.com/). One vendor took me to dinner at Dakota Steakhouse and another (Mr. Kim) to an authentic Korean restaurant. 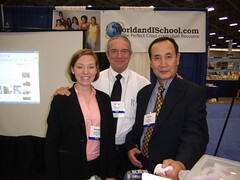 Here is Mr. Kim, his beautiful worker, Elizabeth, and myself. Tomorrow, I’ll be at the Grapevine Books-A-Million for a signing. Of all the BAM’s I’ve done, I expect this one to be the best. More later. It’s raining and hailing here in Dallas, so I better post while I can.